There are about 31,000 verses in the Bible. 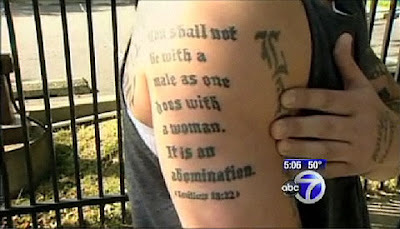 It really says something about this fellow that he chose this one from Leviticus to inscribe permanently on his flesh. Methodist Minister Jeremy points to the incredible idiocy of not reading a chapter further before visiting the tattoo parlor. And the Pope is now trying to poach Anglicans, too, mainly over issues concerning the naughty bits. Those naughty bits again! God, who is Love, has "pitched his mansion in the house of excrement," and the churches seem to be intent on dwelling there.